I do not care what you have to do to get this, you win blizzard! ill do 2 months of dailies! The model thought to be related to this mount looks almost NOTHING like the standard Pterodactyls we're used to. We aren't allowed to submit out of game images as screenshots... but its very different (still very cool). This mount will in fact be a reward from the new raid meta :D 영예의 천둥 공격대원 (NOTE: its the blue version). so what's your opinion on this guys? tcg or boss drop? ALL OF MY MONEY. FOREVER. Pterodactyl... and still no bat mount? i have a funny feeling that this will come out of one of rare archaeology mount. Looking at the animations on the front page, I can't tell for sure, but I think this uses the proto-drake skeleton. Cool . Really original model . Wow . Does this mount bound with archaeology ? I have a feeling this will be either the new daily rep mount or arch mount. I dont think raid drops or meta achv mounts have that description. I guess this mount will be the Season 12 Gladiator-Mount Reward for the top 0,5% of the pool. I hope its /mountspecial is a pterodactyl screech. Apparently, this mount comes in 4 different colors, which can be seen in this video. There's a blue one with brown highlights, a green one with red highlights, a purple one with grayish highlights, and a red one with dark blue highlights. The red one is the one that's being showed off in the screenshot and the model viewer. They all look awesome actually. Speculation? Most likely one will be a boss drop. It's possible that they'll use two of them for meta-achievements (but they might do that with the triceratops mounts). Who knows. Possibly archeology, or some daily reward. Heck, might be a rare spawn mount, though they haven't done any TLPD style rares so far. Regardless, looks like Blizz has finally given us some really unique mounts! I dont care how much mindless farming og daily grinding I have to do to get this bad boy, but I will do anything to get my hands on this :D! Anyone notice this is spelled "Pteradactyl" not Pterodactyl? Or is this an alternate spelling? Dr. Alan Grant: Life found a way. i think it would be cool if professions could make things like these! alchemy/ poison dripping pterodactyl ? Looking at the model, i'd say the current icon isn't very... fitting. 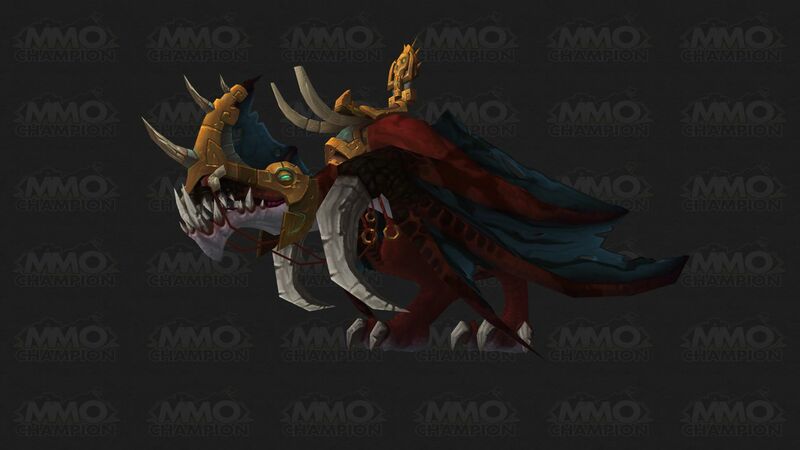 I think it may be the new faction mount, hence there being a very horde looking color of one, and a very Blue and Gold Alliance one. For those claiming this mount to have proto drake skeleton, take a look at the two again please, It does not infact use a protodrake skeleton. Look at the two models, protodrake's standing animation uses their wing's as feet for support, this mount stands on two hind legs legs and has a hunchback like a vulture with wings folded. There are also different idle animations. Such as this mount scratching under it's wing opposed from looking left to right like a proto drake does. example of a re-used proto drake model here. The only similarities i see are the idle "sniff-sniff, roar" thing and the sort of "head bobbing" they do, but as far as I can see, those are the only re-used parts, and even then, this mount has more finesse to it. One could argue that they re-hashed the torso of the protodrake, but this mount is much taller than the protodrake when it comes to torsos imo. Skyscream! You've failed me for the last time.... again! Are there any other versions of Skyscreamers that are non-raid rewards such as like, rare mobs, quest rewards etc? No but really, is there any other version of this mount so far? Would love to get one but I myself am not a raider yet and I don't have the mood to start raiding in MoP so far. I don't know if anyone already said or confirmed this, but I think that maybe this mount is able to fly in the Isle of Thunder. It makes sense, because in the third (or fourth?) stage scenario of the island, you get to fly one of these after Vereesa tells you that this mount is immune to the thunders. Would be totally awesome if this mount lets you fly on Thunder Isle. Someone on horde side has this mount and its blue and gold........ why Is horde version blue? Its stupid! Our core raid group just got these! It is confirmed that it is also a ground mount! Can you use it as a ground mount from level 20? I salute whichever developers creating this beast of a mount! Just a side note, there is currently a bug that causes your character to shrink 25% in size when mounted on this mount. Causing an odd visual effect. They both do a rather large jump into the air which may come in handy in many situations. This pterodactyl is so over the top that I love it immediately. Sad I wasn't a part of a raiding guild back in MoP but once I get some average gear I'm starting achievement hunting for this pretty pretty boy. Or girl. You never know Kappa. Now I didn't do normal modes in MoP, so I never saw this bad boy. Heck, even on the server I never really see these. When I did see it during the WoD beta, I knew I had to have it. So we mustered up the people, and we're knocking these achievements out, because who doesn't want to ride a freaking pterodactyl? On 09/01/2016: I got my last achievement: ''You Said Crossing the Streams Was Bad'' to get the Glory of the Thundering Raider for this mount. I was over the moon when I got it, because I have always wanted it. It took me a long time to get some people together that actually managed to do it. It's a beautiful and very unique mount. To those who are still struggling to get this achievement, don't give up! Beware of Troll-players that don't have this mount yet, you might pop their Beserk! I don't love rare mounts, I love detailed mounts - for me one of the best mounts in the game is the Turbo Charged Flying machine, simply because of how detailed, noisy and animated it is. What I haven't seen mentioned anywhere is the sound this dude makes! I haven't heard a single reused asset from any other mount. When he takes off, it's akin to a leaping creature taking flight rather than a very generic "Swosh." The wings flapping sound powerful, weighty, as though they were meant to glide rather than flap. He snorts and roars passively, making it a very personable mount even when flying. When running or taking off, you can hear it's troll chains jingle. It's mouth makes an audible jaw snapping sound, like a crocodile. It's /mountspecial is appropriately a dinosaur roar, not too loud or too powerful; it's a proper screech, complete with tongue. When landing, it is silent, as a pterosaur should be. He flutters his wings low to the ground if you sit still long enough, an alternative mountspecial animation that cannot be trigged. I had been after this mount since MoP, since I saw the screenshots for it. I love dinosaurs (and flying reptiles.) Back in the day, I called Thunder Isle the "Dinosaur Patch" because that's what it was. Triceratops to be mounted and tamed, and Pterosaurs to ride through the sky! I may main a Mage, but my hunter was to be the dinosaur tribe leader. MoP came and went, I didn't play Warlords and come Legion I have finally obtained this mount with some help from a friend, and soloing the last few achievements. Sadly, I never see many of these in the air. I feel that it is one of the more forgotten mounts which is a real shame, nowadays most of this is easily soloable and hell, I did soft hands as a Mage with slowfall, so grab a friend and sort it out. It is the only Glory mount that is not shared with other recolour within the game so this makes it UNIQUE. counting towards the Lord of the Reins achievement. 사용 효과: 탈것 소환하는 법을 배웁니다. 타기 숙련도와 위치에 따라 능력이 변하는 탈것입니다. "폭정을 일삼는 모구들의 도전을 이겨낸 영웅들만이 전투 갈망하는 비명익룡의 등에 올라타 하늘을 누빌 수 있습니다."